Pictorial Odyssey: Stoop Low To Climb High. Touching Feet of elders and enlightened beings is considered true mark of respect and sign of humility in Indian culture. Seeking the blessings of god men is seen as a shortcut to accumulate good Karma. How is this possible? According to Indian belief system, when a god man blesses, his good Karma is transferred to the blessed. This Karma-Transference does not diminish the accumulated treasure of the god man, but still does help the blessed through transference. Sometimes such transference occurs by enacting the mere form without even the substance attendant belief. Politicians latched onto this *Karma- Transference* principal from the early years of the nascent Indian republic and turned it into an art form. They did it not to gain merit in after life or next life; but to make gains in this life, here and now. They reckoned that by making a show of devotion and loyalty to a god man, the faith and love (more solidly, their votes come election) of his devotees would stand transferred to their credit through Karma-Transference. Well, I am sorry to have painted politicians as pure faithless mercenaries. They were not and are not so completely. They too have their blind spots and believes. Elections are in the air, and here is a round up of god-men circuit, new and old. 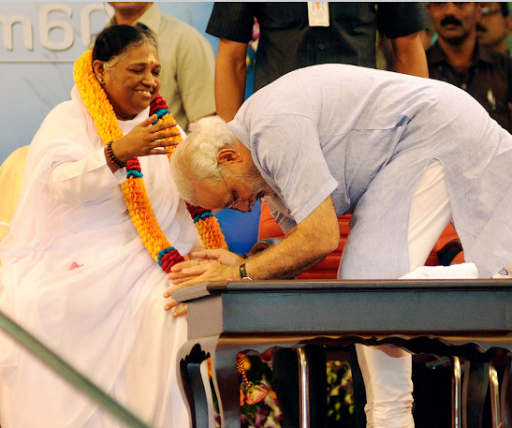 Narendra Modi bends before Ma Amritanandmayi to garner support for his Prime Ministerial ambitions. Digvijay Singh, Congress General Secretary, and Modi’s bête noire, bends sometime in the past before Asaram Bapu, who is currently in Jodhpur jail perhaps teaching *godly virtues* to fellow inmates. Nitin Gadkari’s weighty persona was backed for second consecutive term as president of BJP by RSS in contravention of the party’s constitution; and he almost made it but for the allegations of corruption about his Purti Group, which surfaced to scuttle his bid. 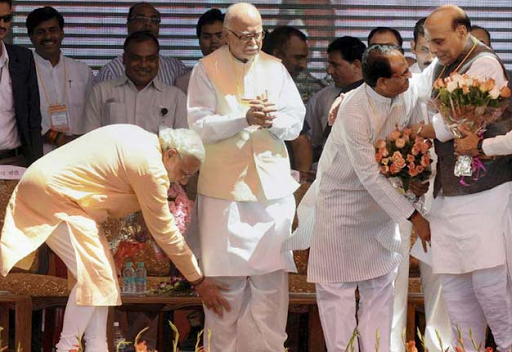 Here he touches the feet of Baba Ramdev, who claims to cure everything -well almost- through his Yoga techniques, but went for bariatric surgery at the hands of surgeon Muffazal Lakdawala of Saifee Hospital to cure his own obesity problem. B S Yediyurappa led BJP to rule Karnataka for the first ever victory of the party in the southern states; but later had to quit over allegations of corruption. Here he seeks blessings of Sri Balgangadharnath Swamiji. Modi, who is considered to be arrogant and autocratic, is assiduously trying to cultivate, it seems, an image of humility and empathy. 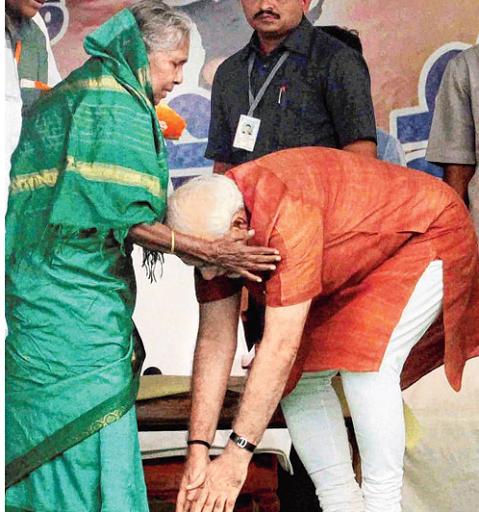 Here he is touching the feet of an elderly lady in Hyderabad. When it comes to respect of elders, Indians are second to none seems to be Modi’s message at Bhopal, where he seeks to build bridges with BJP patriarch, Lal Krishna Advani. However, latter seems to be so miffed with his onetime protege that he fails to make even a show of good grace by acknowledging Modi’s obeisance, so what if both acts were for the consumption of the audience. This glimpse of *Stooping Low* to *Climb High* may look heavily biased in favour of BJP; but the fact is that entire political class is complicit in the act. The stormy petrel of Indian politics, Indira Gandhi, too sought blessings of god men a plenty. Unfortunately, I could not find a photograph on the net of Devraha Baba blessing her by touching her head with his foot, which was his wont. “He received visits from politicians seeking his blessings at the time of general elections, including Indira Gandhi, Buta Singh, and Rajiv Gandhi. Rajiv Gandhi and his wife Sonia Gandhi visited his ashram on the eve of the 1989 elections. He used to bless the devotees with his feet. He lived on a 12-foot-high (3.7 m) wooden platform near the river and wore a small deerskin. A barricade of wooden planks hid his semi-naked body from his devotees, and he came down (occasionally) only to bathe in the river“. He is seen below sitting on his *Machan*. Satya Sai Baba was another favourite god man among the politicians, and counted many powerful leaders among his devotees including former Congress prime minister, P Narasimha Rao. However, to the credit of the politicians, they just don’t bend, they also make others bend before them. Since bending and psycho fancy comes naturally to Indians, it makes for a competitive showing. Mayawati of BSP having her feet touched by a man, who is still standing. 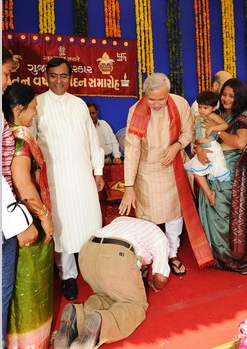 Modi has a man at his feet knelt on his knees. 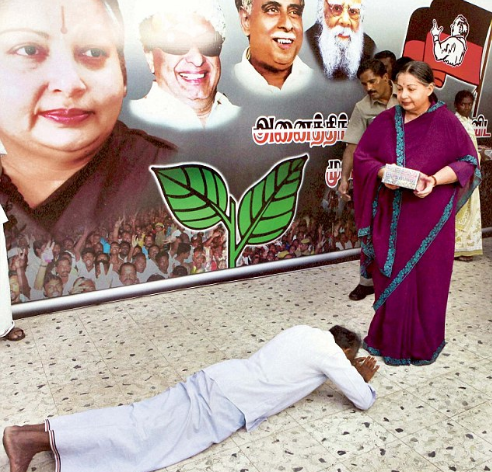 Political Amma, J Jayalalitha won’t even be touched by the supplicant, who is prostrate on the ground. This is considered as the ultimate form of devotion.